Whew, November has finally come to an end! We're sure you noticed, but in case you didn't - this past month was NaBloPoMo. Kind of a weird name, right? It stands for National Blog Posting Month and it happens once a year (each November) and this year we decided to participate. What that meant was posting every day throughout the month of November in honor of NaBloPoMo, and we'll be honest - it wasn't easy. Coming up with content for all 30 days of the month was the easy part..the hard part was we hit a lot of unexpected (and a few expected) road blocks along the way. To start with, Clint and the boys all 3 got colds, while I was hospitalized many times with pneumonia (among other things). Then, there was a death in the family that took us out of town for nearly 5 days, mixed in with funerals, tons of out of state family in town, and the holidays which took us out of town again for several days. Needless to say, it is nothing sort of a miracle (or dedication) that we were able to complete this challenge. This month definitely through a lot of hard challenges our way, but we overcame them and, as the saying goes - "what doesn't kill you makes you stronger" and that definitely holds true in this case. We're looking forward to a great December and a great Christmas! The holidays are definitely my favorite time of the year. But, before we get to December and all the fun things that we have planned for Learning Domestic Discipline, we need to put a cap on November and we're doing that by listing out all of the posts from this months NaBloPoMo challenge in case you missed any (because there were a lot!). Let's get started. November 1st - Inconsistency vs. Priorities in Domestic Discipline which we consider a must-read for all domestic discipline couples, especially beginners. The post details how to tell when your partner is truly being inconsistent, vs. just having a different priority with the rules. November 2nd - The October 2014 Monthly Recap. We try to do these once a month because we end up posting a lot when the month is all said and done, and we want to make sure no one misses anything that they might want to read. As the name implies, the October monthly recap goes over all of our posts from the month of October. November 2nd - HOH Thoughts During a Spanking. Yup, we posted twice in one day - and no, that wasn't an error. The HOH Thoughts During a Spanking ended up being one of the most popular posts this month. Clint listed out some of the things he thinks about during a spanking, and what his thought process is. A lot of people found it really helpful, and we're so glad! November 3rd - Mailbag Monday Week 67. For the 67th week of Mailbag Monday we answered 3 reader-submitted questions on expectations after a spanking, what implements we use for a spanking, and getting your husband on board with the idea of domestic discipline. November 5th - Advanced Level Spankings (The Alternate Version) is a post that we'd actually been wanting to write for awhile because we thought it would really help those who felt that the original Advanced Level Spanking's method was either too basic for them, or didn't give the desired results. So, this version actually incorporates both the original Advanced Level Spanking's method and the Blended Spanking's method into one. November 6th - A Big Announcement - Introducing the LDD Workshop Style Beginner's Retreat. This retreat is something that has been in the works for awhile now and we were so excited to finally announce it. This retreat is separate from the regular LDD Retreat in the sense that it is a 3-day workshop style retreat that includes domestic discipline orientated workshops for submissive partners, HOHs and couples. It is being held in March of 2015 and you can find out more information by clicking here. November 7th - Five Things Friday: The November Edition was our first Five Things post of the month. We talked a little about NaBloPoMo and the annual Love Our Lurkers Day, as well as some personal challenges we had been having, and more information about the beginner's retreat. November 8th - How to Choose Which Spanking Implements to Use is a post that we based off of questions that we sometimes get regarding HOHs not being certain how to choose what implements can properly suit which offense, which are quiet implements, etc. This post details out which implements we recommend for beginners, severe implements, warm-up implements, and more as well as why we recommend using more than one implement during each spanking session (which is another question we often receive). November 9th - Chelsea's Thoughts During a Spanking. Similar to how Clint posted his HOH Thoughts During a Spanking earlier in the month, I decided to do the same. It was harder to write than I expected it to be! I wrote the post in the same format that Clint did, detailing out my thoughts as we go through a punishment spanking. It isn't easy to write about, or think about, but the post turned out pretty well I think, when it was all said and done. November 10th - A Few Things We Want You To Know is a post that we put up right in the middle of us going out of town for a death in the family. It was a hectic time for us (that is an understatement) but we figured this post was the best way to get the information out to everyone about the status of the LDD Meetups, our new eBook, the beginner's retreat, and more. November 11th - One-Day Domestic Discipline Boot Camp Is Here! Our latest eBook was released this month and is the latest edition to our boot camp series of books. This eBook walks a couple through how to complete a domestic discipline boot camp in just one day without changing your schedule, hiring a babysitter, etc. The book is designed for those who have hectic work schedules, children, and other obstacles that might make conducting a regular boot camp a little difficult. We also redid all of our eBook packages. November 12th - Love Our Lurkers Day is an annual event throughout blogland that encourages readers who don't ordinarily comment to come out of their shell and say hello. We love LOL (Love Our Lurkers) Day because it allows us to interact with our readers on a more personal level, which is always fun for us. November 13th - Love Our Lurkers Day Part 2. This year, LOL Day was broken into 2 days so we dedicated 2 posts to it. This is the second installment of our Love Our Lurkers Day post. November 14th - Spanking Chelsea, Domestic Discipline Wedding Gifts, and Wives Who Ask Mother in Laws for a Spanking. That's quite the title, huh? In case you're wondering (which you probably are..) what all of those phrases have in common, you'll have to read the post to see. It's a pretty entertaining post, we must say. November 15th - The "What's Next" Phase - You're Doing Domestic Discipline, Now What? This post was another that came based off of questions we had received for awhile now regarding what to do after you've both agreed to practice domestic discipline. A lot of couples hit a "stumbling block", so to speak, and have a difficult time figuring out how to begin incorporating the lifestyle into their everyday life without just standing around waiting for a rule to be broken. This post gives our recommendations for how to slowly implement domestic discipline without the waiting, and the confusion. November 16th - Registration for the 2015 LDD Beginner's Retreat is Open! On the 16th we opened registration for the beginner's retreat that we talked about earlier in the month. Once again, you can find more info here. November 17th - Mailbag Monday Week 68. On this edition of Mailbag Monday we answered questions on what Clint thinks is the hardest part about being an HOH, a dilemma with one wife's HOH and his expectations, and incorporating spanking as a punishment when the HOH isn't on board. November 18th - Trusting my HOH and Learning to Let Go. This was another personal post that details out one story (of many) where I had to put a lot of trust into Clint, and how it all ended up turning out okay in the end. One of the hardest parts about being a submissive wife (in my opinion) is learning to let go having a certain level of control and this post shows just that. It really isn't easy. November 19th - How to Try to Get Out of a Spanking is probably one of my favorite posts we put up this month (Clint might disagree though). The post includes screenshots from an actual text conversation that Clint and I had regarding a rule being broken, and how I managed to somehow get out of getting spanked. Too bad it didn't get me out of being punished all together! November 20th - The LDD Meetups Are Back! Finally we were able to bring back the LDD Meetups after a long wait. We appreciate everyone's patience while we got some new policies put into place. We opened registrations for a few meetups last week and will continue with more in the upcoming weeks. 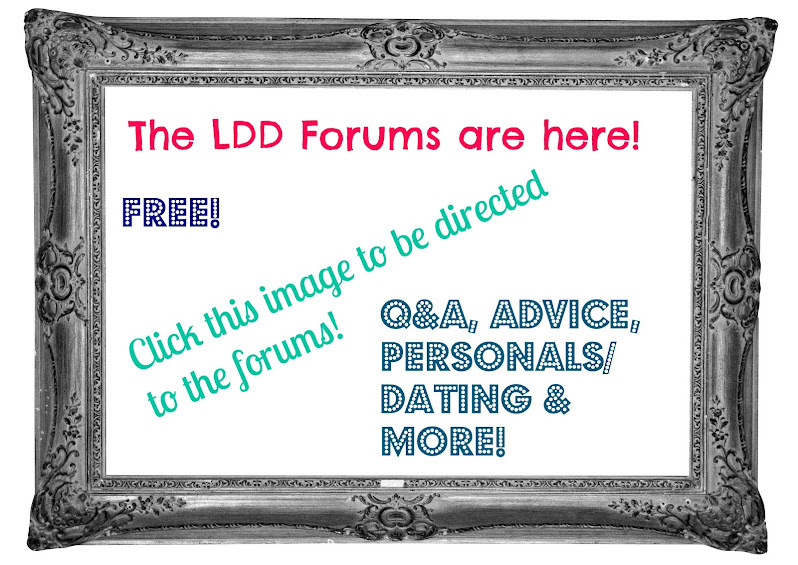 Check the LDD Meetups site for the dates and times! November 21st - Five Things Friday: The Thanksgiving Edition was written by Clint this time and he did a great job (as usual). In this edition, Clint talks about my latest punishment, the retreat, the meetups, a tweet of his that made the local news, and answers a few questions about Thanksgiving! November 22nd - Learning Domestic Discipline's December Checklist goes over a few of our goals for Learning Domestic Discipline for the month of December. Among the things we have planned are to redo the blog, and to implement a "Submissive Saturday's" column, or something similar. We're looking forward to a lot of fun things in December, actually. This is our last chance to get our 2014 goals met! Think we can do it? November 23rd - Confessions of a Submissive Wife is another post that I really wasn't sure would make it up onto the blog, but it did. It's one of those posts that seems so easy to write until you actually sit down to do it and then it just seems so difficult. I wrote this post without thinking about how the things I'm writing sound, or how I might get judged for it, which is rare. Instead, these are raw thoughts and confessions about what it's like for me to be a submissive wife. I'm just glad the post was well-received - thanks everyone. November 24th - Mailbag Monday Week 69 is in the books. For this week of Mailbag Monday we answered 3 more reader-submitted questions on Red Booty Woman returning to blogland, visiting England, and domestic discipline around the holidays. They were 3 great questions, as usual! November 26th - When Chelsea Says... is a post that Clint will probably tell you was his favorite of the month. It's a spinoff of one that we did back in June titled "When Clint Says..." and it's pretty funny, I have to admit. I knew he knew me really well, but c'mon..I need to think of some new phrases, apparently! November 28th - It's Black Friday at Learning Domestic Discipline. We decided to throw our own Black Friday sale this year, and it was/is definitely our biggest sale of the season. We started with 50% off sitewide, and from now until Monday evening everything is 30% off. So, if you've been eyeing our new eBook, packages, memberships, consults, whatever - now is your chance! November 29th - Saturday Stories: The Show Must Go On. We relaunched our Saturday Stories feature after a brief hiatus. This week we featured a story written by Carol, who some of you might remember wrote another Saturday Story for us this past March. And then that brings us to today's post for November 30th. 30 posts - 30 days - and I have no idea how we did it. :) Thanks for coming along this crazy ride with us and we'll see you in December!